Samuel changed to sleeping in a bed yesterday. He had his last night in the cot on Monday night, and attempted to have a nap in the cot on Tuesday afternoon (turned out that there wasn’t any sleep). 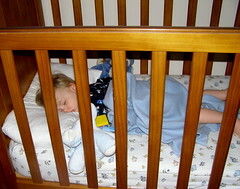 After that, we took the side rails off the cot, and swapped the foot for the shorter end. It’s not quite a ‘real’ bed, but it looks more-or-less like one, and we didn’t feel that buying a new bed for him made sense at this time (and anything bigger wouldn’t fit well in the room). It was just me & Samuel home for the first try (Olyvia was at the gym). He’d seen the bed during the day (and found that it’s a good platform to jump off, and that he can now get to both sets of windows in his room), and didn’t seem concerned at all about the change. He said goodbye as normal, and apart from one little cry (which sometimes happens anyway) all was well. I always check in on him just before I go to bed (11:30 or so) – normally turning him around, tucking him in, and so on. 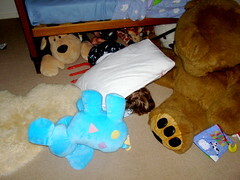 When I did this, I found that he’d fallen to the floor at some point, but hadn’t made (nearly) any noise doing so (or we would have heard him), and hadn’t woken up as a result. I’m sure this won’t be the last time! I put him back in the bed (he didn’t wake up at all), and the rest of the night passed without incident. This morning he woke up around 7am as normal, and after talking for a little while he opened his door and came and found me (Olyvia was out again, this time picking up the Kelly kids). He was quite happy and the morning started off as well as ever. I knew that the real challenge would be his nap, since the only time he has trouble going to sleep at night is when he’s sick, but during the day he’s not always convinced that he needs a nap. I put him to bed around the normal time (he was clearly tired), but he wasn’t happy about it. A minute or two after leaving the room, he came out, and so I put him back, explaining that he had to stay there. We repeated this with varying gaps between him appearing maybe a dozen times. He was getting a little upset, so I decided that the tough stance could wait a while. I put him in bed, and read him a story (he happily stayed in the bed for the story). That mostly calmed him down, but I stayed next to the bed for a while until he was basically asleep anyway. Leaving the room, the squeaky door (I must remember to oil it!) woke him up, so we repeated this. Next time went fine, and he drifted off to sleep pretty quickly. He woke up a bit over an hour later (a short sleep for him, but not completely unusual). I heard a thump (I work in the room next door) and went him to find him on the floor. I’m pretty sure he was getting up and slipped rather than falling out while asleep – he was immediately happy and awake. All went well again tonight, so hopefully the transition continues smoothly! 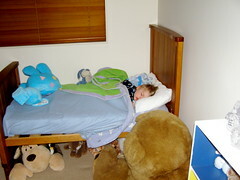 Posted in Uncategorized.Tagged bed, cot, first, last, sam, samuel, sleeping.